I have spent countless hours and on the QU-BD with all the ideas that I've read from the web and some of my own and still get jams with PLA. The best I've been able to do is with a barrel that I spent about 2 hours polishing the inside to a mirror finish. It still jams once in a while though. 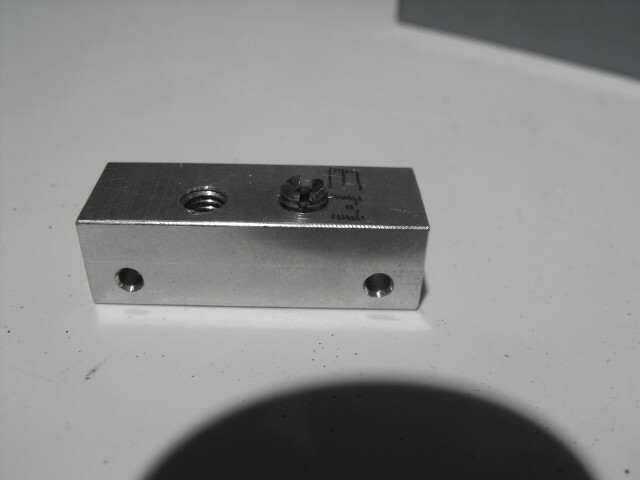 While looking at all the hotend that are reliable, I see that the common thing is the use of PFTE for the tube. So here is how I've come up with a easy way to install some PFTE tubing in the barrel. Clamp the coldend in the vise and the barrel in the drill press chuck(only hand tighten the chuck). Aline one of the barrel holes in the coldend to the center of the spindle of the drill press using the barrel to aline it. The barrel should thread in the coldend if you have it centered. Take the barrel out of the drill press and use the Dremel with a cutoff wheel and cut the barrel in two at the thin area that has no threads. Take the longer of the two and screw it in to the coldend with a jam nut. Tighten the jam nut and use the #22 drill bit and drill it out. Take the barrel out of the coldend and put in the drill press chuck with the end you cut down. 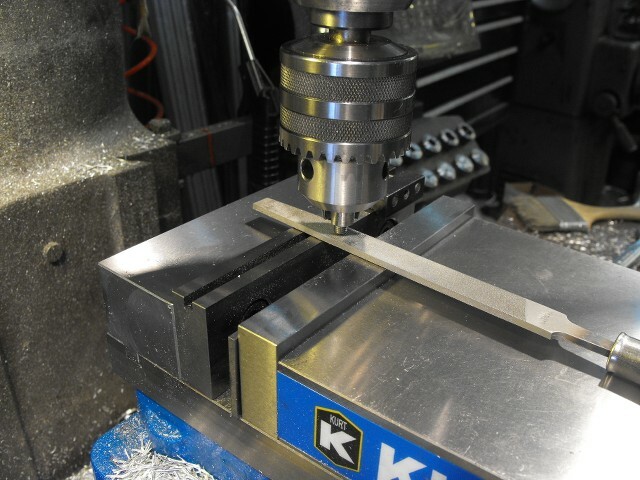 Turn the drill press on and bring it down to the file using light pressure. You want to just square the end with the file. 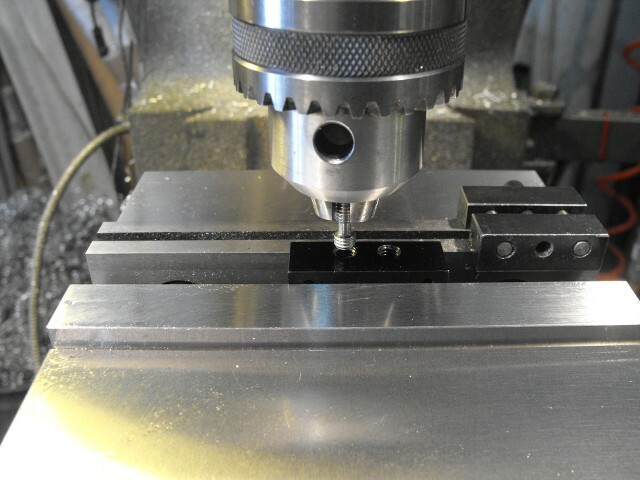 Take the short barrel and mount in drill chuck and use file to square the end. Screw the long piece in the coldend and from the other side, screw the short end with the cut end up. 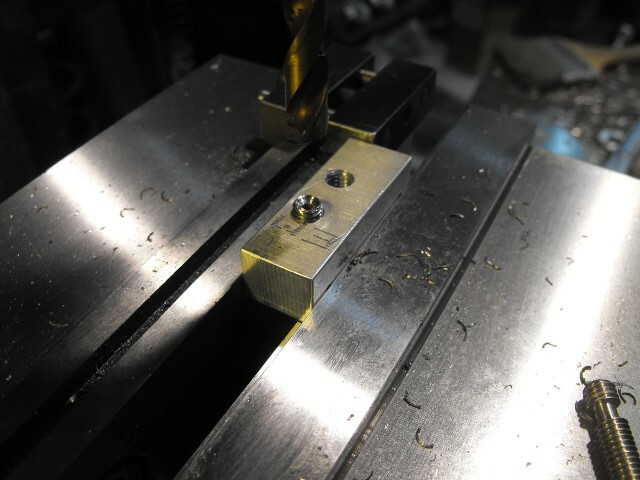 Center under spindle of the drill press and use the 5/16" drill bit and use it the bevel the hole. Use the Dremel and cut a slot for a straight blade screwdriver. Take the #50 drill bit and drill a hole on the side close to the bottom, centered with the bore for the nozzle of the alum hotend. This will be for the thermistor. 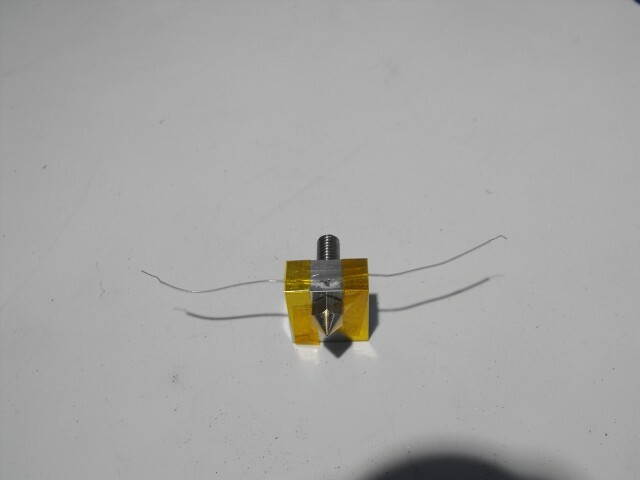 Screw the nozzle in the hotend till tight, and then loosen 1/2 turn. Screw the long barrel with the original machined end against the nozzle. Install a jam nut on the barrel to insure the barrel doesn't turn when you tighten the nozzle. 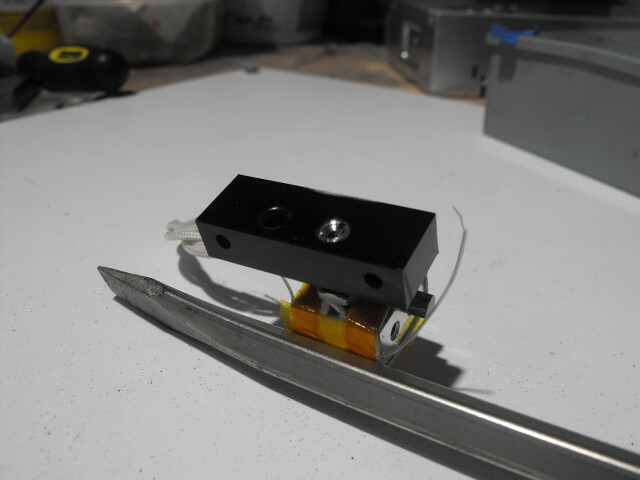 mount hotend in a vise with the nozzle up and tighten it real tight. Slide the PFTE tubing in the barrel and use the razor blade, cut flush with the end of the barrel. Take a small dab of the heat sink compound and put it in the hole you drilled for the thermistor. 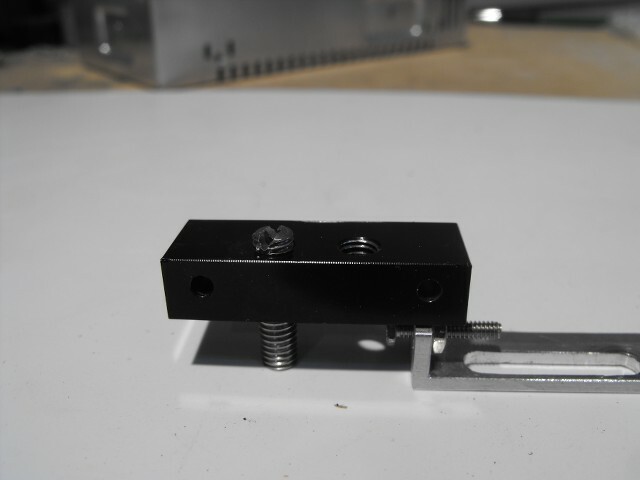 With PFTE installed on the thermistor leads, install the thermistor in the hole you drilled for it. Take Kapton tape and tape as seen in photo. Install the insulation on the hot end and use some heat sink compound and install the heater cartridge. Screw the short piece of barrel into he coldend till you have 1 or 2 threads sticking out. 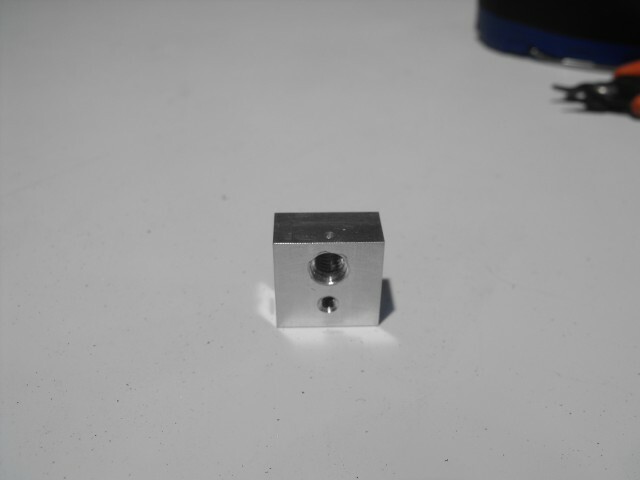 Install a jamnut on the hotend assembly. Screw the barrel of the hotend into the coldend till it is against the other barrel piece. Unscrew the short piece and put a drop of thread lock compound on it. Reinstall and tighten it with a screw driver. Install assembly on your extruder. Do the upgrades on the extruder that Bart has posted in the wiki and you'll have a very reliable, jam free QU-BD extruder. Last edited by REdington on Wed Feb 25, 2015 1:49 am, edited 6 times in total. I've printed for over 50 hours with PLA and no jams. I haven't tried ABS yet, but shouldn't be any problems. I even left the hotend on for 20 minutes with PLA and it would still extrude. I have over 100 hours of printing with PLA and another 25 to 30 with ABS mixed in there on the one of the ones I've made without any problems. Temps for the hotend has been at 190 C for PLA and 235 to 240 C with ABS. I also been setting the bed temp for PLA at 100C and it sticks to clean glass very good. The prints just pops off the glass after about 15 to 30 minutes after the bed is turned off. I just ordered a bunch of this PFTE for this mod. I will put a couple inches in the mail for folks for $2 (paypal gift to mike at thewoodworker dot net) if you live in the USA and I can send it to you in a letter envelope. This way you don't pay the $6 shipping to Mcmaster unless you just want to. Just an offer. Should be here in two days. If you send the money pm me your mailing address and your paypal name. Drilled my barrel today. 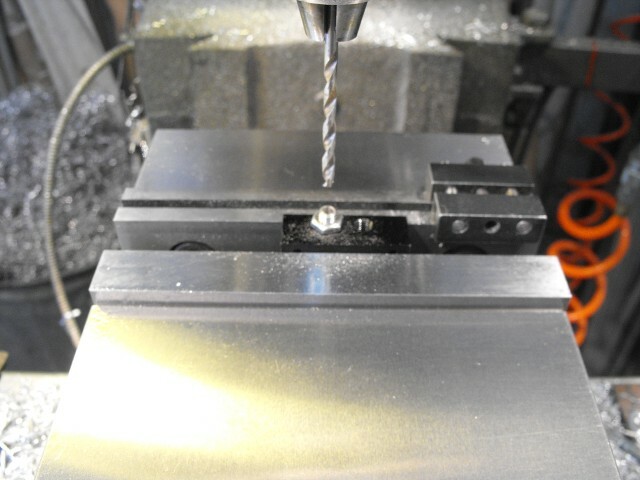 Ended up using a small metal lathe as I wanted center accuracy between the drill and barrel. Would there be an advantage to running the PTFE through both the pieces of the barrel in thr assembly instead of just the long piece? The tubing must be kept captive. If not, the nozzle pressure will push the tubing up and out of the barrel. So you did NOT size 22 drill the small portion then?